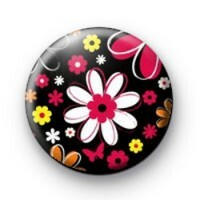 This is a 1 inch button badge with a really cute flower pattern. It has fun, bright flowers all across the front and it looks very pretty. Its a lovely floral design and would be a nice badge to use in your own craft projects or you can wear this pinned to your coat or bag.